I've made some Dulce De Leche for a tart recipe, and still have more than a jar left. So I'll be using it for various recipes using dulce de leche, which I have bookmarked to try for ages. One of it is, Whoopie Pies with Salted Dulce de Leche. Even though Whoopie Pies are listed as under Cookies, they are really cake-like, and to me, are really little mini cakes. Sandwiched with some filling, they make nice little snacks. The dough for these cookies are really very thick batter, which needs to be refrigerated for 2 hours to firm up before shaping into small balls. You will need to wet your hands when shaping tablespoons of the thick batter into little rounds and place on a parchment lined baking sheet, spacing them slightly apart, and pressing them down a little. These cookies are baked for just 8-10 minutes until puffed and slightly firm. Leave to cool on pans for 5 minutes, then tranfer to the wire racks to cool completely. The filling is made of ; butter, confectioners' sugar, a little heavy cream, salt and dulce de leche. I have reduced the amount of the confectioners' sugar to half. I like this filling, as it is not too sweet, even with the dulce de leche, very nice actually. Spread some filling on the flat side of one cookie and top with another cookie, with flat side on filling. The recipe indicate to refrigerate the whoopie pies for at least 1 hour until the filling is set. But there's really no need for that, the filling is firm enough that it holds very well. Plus we could not wait to taste it right away! I was expecting these cookies to be on the sweet side, but surprisingly the sweetness is just right. Maybe because I reduced the brown sugar for the batter slightly, by using about 3 tablespoons less than the amount stated in the recipe. The cookies are a little chocolaty bitter and goes perfectly well with the not-so-sweet filling. Very nice! For those who love a sweeter cookie, use the full amount of brown sugar as per the recipe. I keep the leftovers in the refrigerator and they are as good on the next day. The Whoopie Pies cookie is soft, chocolaty, moist and perfect with the salted Dulce de Leche filling. Welcome to Sweet Savoury Crumbs! 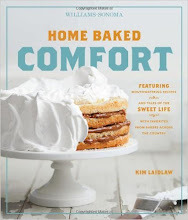 A record of my baking project to bake all recipes from one selected cookbook and I'm starting with one of my favourite baking book, Williams-Sonoma's, Home Baked Comfort by Kim Laidlaw.